When Vilachack served a tour in Qatar, he found time to take the weight room seriously. Follow his nutritional program and see how he won our 2011 Military Challenge! If you've ever eaten an MRE (Meals-Ready-To-Eat) you know how the military feeds its servicewomen and men. Vilachack Ladara, who said he has eaten two full MREs in one sitting, built a diet to empower his training, eating mostly at the chow hall while on deployment (saving him from the daily MREs of the field). Now that his tour is over, he eats/cooks at home, takes meals with him and diligently maps out each meal to set his body in motion for his trying workouts. 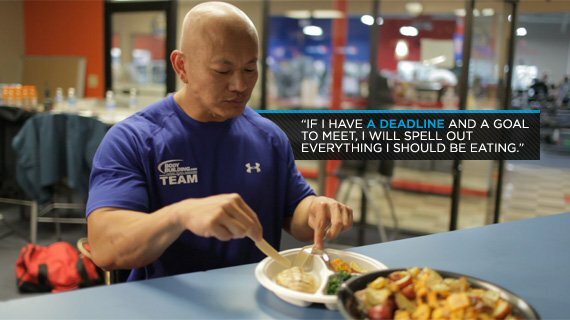 "If I have a deadline and a goal to meet, then I will spell out my diet--, everything I should be eating (carbs and protein). I try to eat enough calories for my frame (high protein, low carbs usually). That's the trick for dropping fat for me." Vilachack certainly enjoys some home cooking. He said his dinners are usually his best meals, because his wife cooks them. Vilachack uses his Sundays to load up on carbohydrates. He actually eats a dessert! Then he goes back into depletion mode just to keep his body off balance. 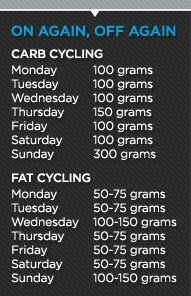 He only carb-cycles before a show or a deadline to help drop body fat. "I'm the carb-dependent type that holds on to body fat," Ladara said. "If I have a lot of carbs, I'll blow up, gain a lot of weight and hold a lot of water. If I keep it under 200 grams per day I will drop weight." That's the sort of investigation everyone needs to make on their own, to really discover how their body reacts to different amounts of food each day. Not everyone will get the same results, even if they follow the exact same plan. That's why patience is the life-blood of bodybuilding. "I believe in eating what you want and not depriving yourself, but not eating a whole pizza!" Ladara said. "If you're craving pizza, have a slice on your high-calorie day. I like starches, french fries and fried chicken." The good captain has a soft spot for natural peanut butter and sugar-free jelly sandwiches. It's a sweet little cheat that really isn't a cheat. See, a little physiological deception goes a long way! "I like to keep my protein intake high, around 300 grams per day and carbs and fat low, around 100 grams each per day on average. My protein sources are the standard: chicken breast, fish (tilapia fillets, salmon, tuna, red snapper, anything I can get from the seafood market) and beef. I eat a steak a couple times per week. I also eat lots of eggs, cottage cheese and drink a lot protein powder. "I try to keep my carbohydrate sources clean: oatmeal, whole wheat breads, brown rice, sweet potato, some fruits, Greek yogurt, and green vegetables (broccoli, spinach, lettuce, asparagus)."